August 21st, 2017 is set to be a historic day: The entire continental U.S. will experience a partial eclipse (making our blog headline slightly misleading), with the path of totality sweeping from Oregon to South Carolina. “Totality” refers to when the moon completely blocks the sun. It’s been hundreds of years since an eclipse only made landfall in the U.S., and this one is notable for being so accessible. Plus, because the eclipse will be total along its entire accessible path and visible as a partial eclipse for the entire continental U.S., this event is getting a ton of attention. But is it really that special, on an astronomical scale? I wanted to find out, so I went to the source: NASA. There, I found a Five Millennium Catalog of Hybrid Solar Eclipses. Turns out, there are a lot of solar eclipses. There’s also a lot more that goes into tracking and describing an eclipse than I realized! Thank goodness there was a key to the data set. 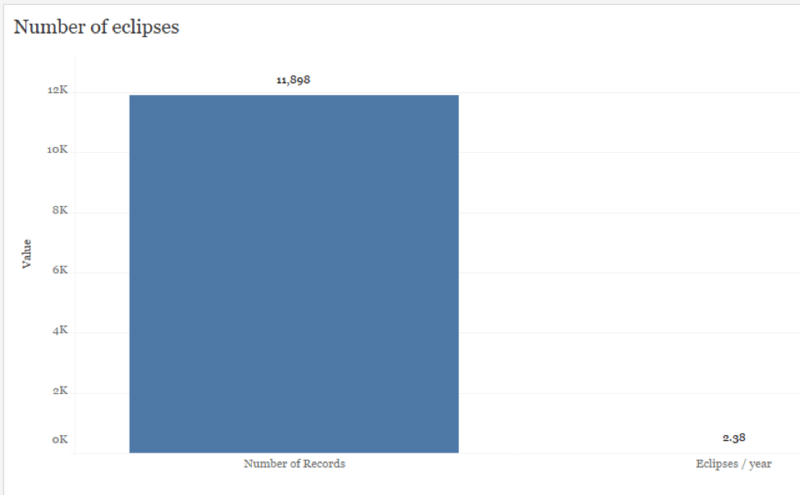 This bar chart shows the number of eclipses in the data set, as well as the number of eclipses per year. 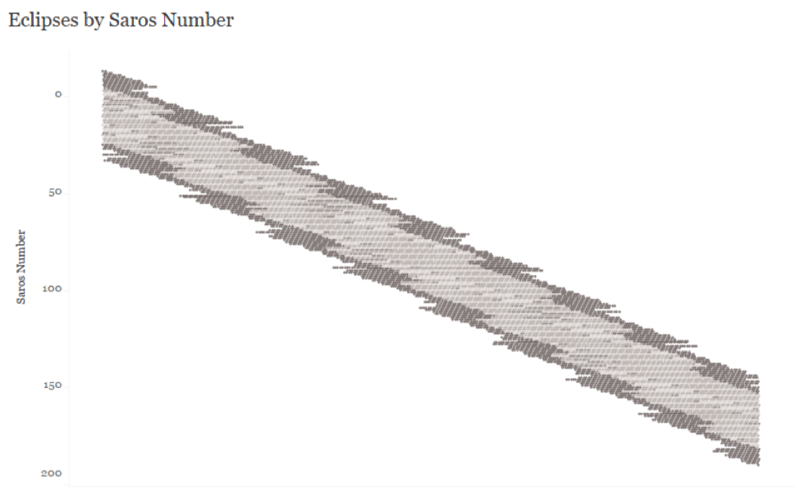 I used the calc (SUM([Number of Records])/COUNTD(Year)). Almost 27% of solar eclipses are total. Others are (1) partial, where the moon doesn’t fully mask the sun; (2) annular, where the moon is directly over the sun but too far away (i.e. appearing too small) to fully block out the sun; or (3) hybrid, a combination of total and annular. 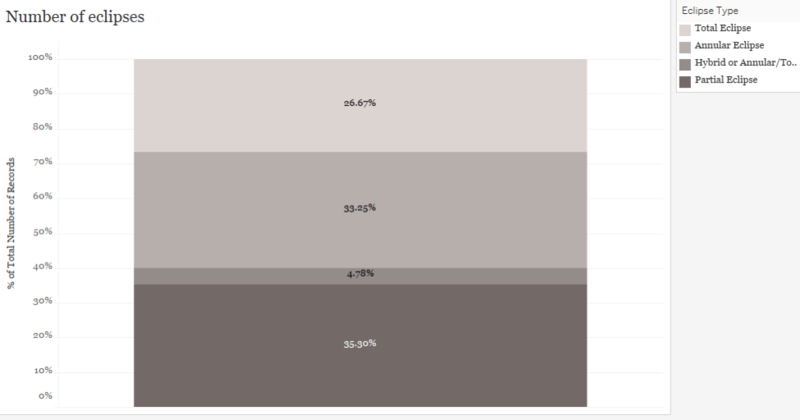 This stacked bar chart shows the percent of eclipses that fall into each type. Note how few eclipses are Total, compared to Annular or Partial. 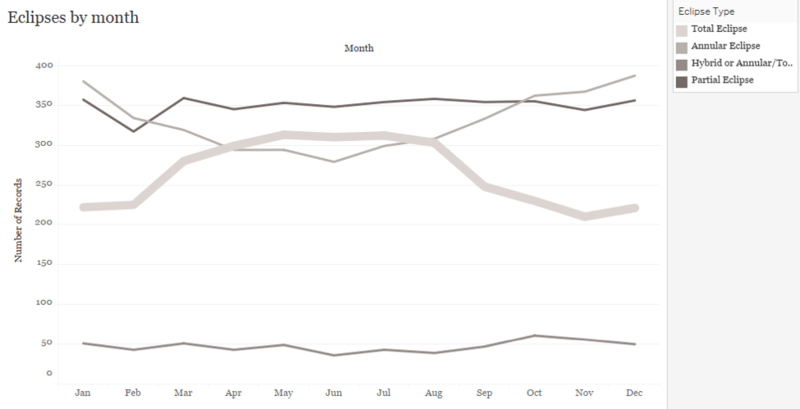 This line chart shows the count of eclipses of each type broken out by month. Note the dip in Annular eclipses and the corresponding rise in Total eclipses from March to September. 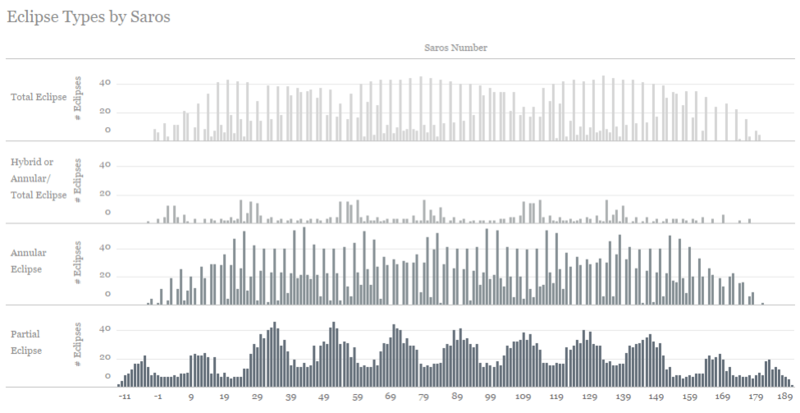 But things got really exciting when I started exploring Saros numbers. According to NASA, “The periodicity and recurrence of eclipses is governed by the Saros cycle, a period of approximately 6,585.3 days (18 years 11 days 8 hours).” That definition got me wondering if I could visualize this pattern, and sure enough, I quickly made some fantastic vizzes displaying these finite recurrences. Here, we can see the lifespan of Saros series. As the moon and sun align, we get a string of partial eclipses. Once in alignment, there’s a run of total/annular/hybrid eclipses. After 12-15 centuries, the moon and sun shift out of alignment and the Saros series ends, again with a number of partial eclipses. The y-axis runs from Saros -13 (the oldest in the data set) at the top to Saros 190 at the bottom. Each mark represents an eclipse, as indicated by its catalog number. Moving along the x-axis from left to right moves forward in time. 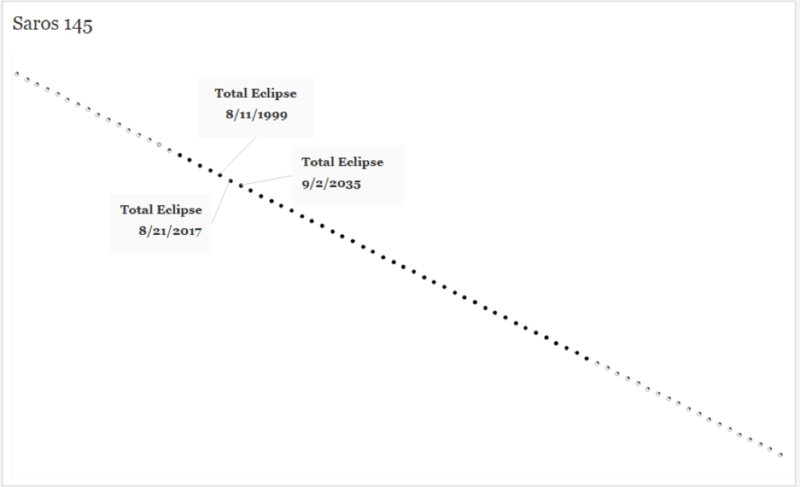 The x-axis is Saros series number and the y-axis is number of eclipses. Note how there are clear and distinct patterns for each type of eclipse. As it happens, the eclipse on August 21st is in Saros 145. The last eclipse in Saros 145 was a total eclipse on August 11th, 1999, and the next will be a total eclipse on September 2nd, 2035. Each mark represents an eclipse in Saros 145, starting with the first partial eclipses in this series in the upper left, and ending with the final partial eclipses in the lower right. The total eclipse on the 21st is still fairly early in this series. Will the 2035 eclipse be as accessible? I wound up creating a story (explore it below!) showcasing some of the more fun things I noticed, but there’s tons of information to be unpacked from this data set—what can you find? IF CONTAINS([Eclipse Type], "P") = TRUE THEN "Partial Eclipse"
ELSEIF CONTAINS([Eclipse Type], "A") = TRUE THEN "Annular Eclipse"
ELSEIF CONTAINS([Eclipse Type], "T") = TRUE THEN "Total Eclipse"
ELSEIF CONTAINS([Eclipse Type], "H") = TRUE THEN "Hybrid or Annular/Total Eclipse"